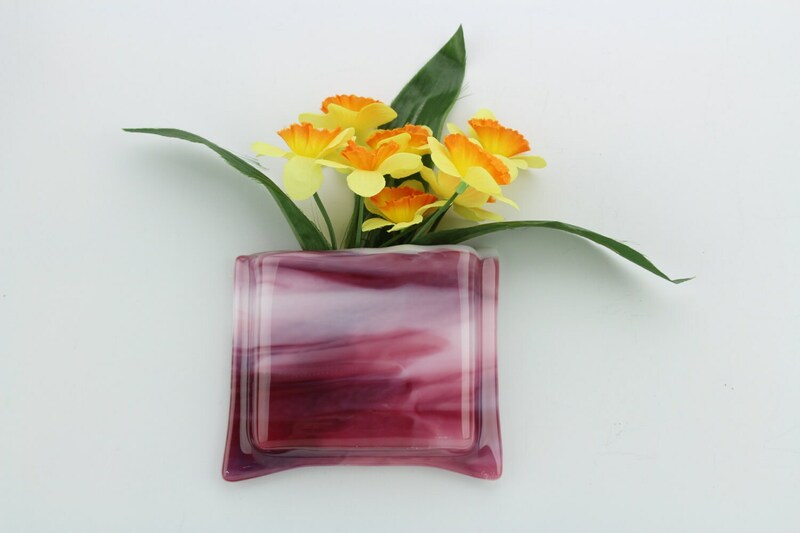 This magnetic notepad holder features elegant streaks and swirls of gorgeous cranberry pink glass with white contrast. This glass vase immediately transforms any space with its versatility and functional beauty. It uses four strong rare earth magnets to securely attach to any magnetic surface including lockers, filing cabinets, office cubicles, and refrigerators. Place a notepad and pen inside to keep your grocery list, to-do list, or family notes handy. It not only will hold your paper and pen, but it has also been expertly designed to be watertight so you can use it as a miniature flower vase! It will make a unique and wonderful gift for your next wedding, housewarming, birthday, Mother’s Day, teacher appreciation, or other special event. Use it as a “Thank you” gift for your valuable clients, customers, or employees. The opening is wide enough to hold a 3” x 5” notepad with pen, an assortment of flowers, or anything else you can imagine to decorate your home and office! The purchase of this listing does not include the flowers used as photography props and all measurements are approximations. These lovely stars arrived very well packaged for international travel but took a long time to journey to me. Lovely! Thanks for selling me the single ornament - it will surely look lovely on my tree. Payment is expected within three days of purchase. Items will not be shipped until payment has been received. No cancellations will be accepted after payment has been received. I do my best to provide accurate photos and descriptions of each piece. Glass can be finicky to photograph and due to differences in computer monitors, the color of the actual item may vary from what you see on the listing. Please don’t hesitate to contact me prior to purchasing with any questions you have or if you would like to see additional photos. A refund will only be given if an item is defective. If your item arrives damaged, please email photos to me within three days showing the condition of the packaging and the item itself. EU residents may return an item within 14 days of receipt of item(s). All orders are shipped within three business days after payment is received, unless otherwise noted in the listing or in my store announcement. I will let you know if I am unable to meet this timeline. Because I believe in recycling as much as I can, I re-use boxes and packing materials whenever possible. Rest assured, though, that I take great care in packaging your items to arrive safely. International orders may be subject to additional duties, taxes, and/or customs fees. These fees are the responsibility of the buyer. Most of the sheets I purchase are limited edition production runs and because no two sheets of glass are exactly the same, no two items are the same. Wholesale Inquiries: If you are interested in purchasing items for resale for your shop, studio, gallery, or store, please send me an email. How will my item(s) be packaged? Rest assured that I take great care in packaging your items to arrive safely. Because I believe in recycling as much as I can, I re-use boxes and packing materials whenever possible. This saves you money as you only pay actual costs for postage and packaging. Will I receive the actual item(s) pictured? The glass art I use is handmade and therefore each sheet of glass has unique streaks and natural variations. I also cut each piece by hand so no individual piece of glass is exactly the same. The photos shown are similar to what you will receive. I do my best to provide accurate photos and descriptions of each piece. Glass can be finicky to photograph and due to differences in computer monitors, the color of the actual item may vary from what you see on the listing. Please don’t hesitate to contact me prior to purchasing with any questions you have or if you would like to see the exact items currently in stock.